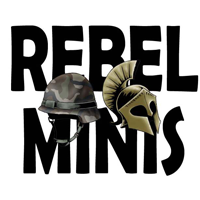 Rebel Minis is a 15mm and 28mm scale manufacturer of miniatures. Our lines consist of Sci-Fi and fantasy with a mixture of modern and pulp. We also publish the Mighty Armies Fantasy Game. Rebel Minis Dark Hold Kobold Kickstarter is Live! No Comments on Rebel Minis Dark Hold Kobold Kickstarter is Live! The Hedgerows and Heroes Kickstarter is Live! No Comments on The Hedgerows and Heroes Kickstarter is Live! Rebel Minis Launches Rise of the Animechs Kickstarter! No Comments on Rebel Minis Launches Rise of the Animechs Kickstarter! Rebel Minis Dark Hold Goblin Adventures Kickstarter Minis & RPG Last Week! No Comments on Rebel Minis Dark Hold Goblin Adventures Kickstarter Minis & RPG Last Week!